An old dream revived and come true. This is the stuff reality shows are made of! I bought that one Que, and its absolutely fabulous. What of the new DVD from OPUSARTE 'Zoroastre'? Is this DVD any good? Anyone had a chance to look at it yet? 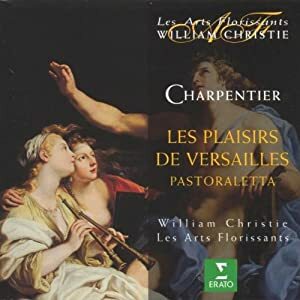 Dear French baroque lovers - still need more Charpentier recommendations! 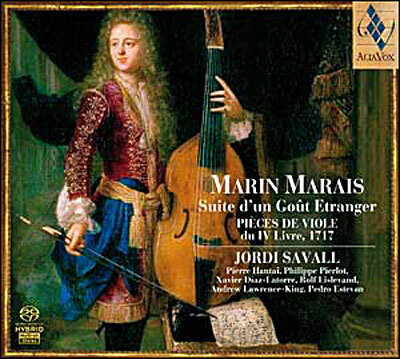 And maybe we could talk some Marin Marais, a composer I'm quite fond of. I don't have that much by him yet, but I believe these are great performances. This cross section of Marais' music by Italian gambist Paolo Pandolfo is smashing. A good choice for an introduction into Marais I think. Another issue I've enjoyed greatly is this 2nd recording with Savall on Alia Vox. Bought this 5CD set a week ago as a (further) introduction into French baroque music. It contains choral pieces of major composers of the period in superb HIP performances, previously issued on Virgin Veritas - also pictured, click pics for their details! For the price of close to two discs (19 euros) you get these repackaged with a booklet containing a short introduction and track listings - unfortunately not the (Latin) texts! Well, buying this turned out to be a very smart move. Great music by great performers. I was already familiar with Rousset and Niquet, but Malgoire, Mandrin and especially Schneebeli and their ensembles are also top notch. 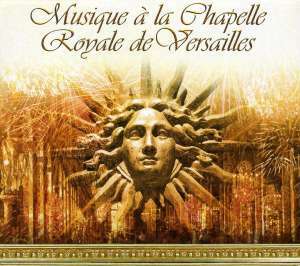 Other familiar names are Véronique Gens (Rameau), Sandrine Piau (Couperin), Jean Paul Fouchécourt, and others. Generally I was impressed by the quality of the music and the diversity between composers - no, it does not sound all the same! 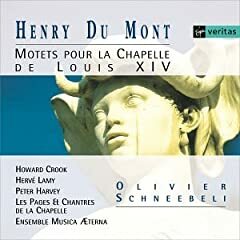 Henry Du Mont (Disc 1) is a new composer to me - and the earliest of these five - makes a very favourable impression: quite dramatic and gutsy, with vivid and inventive instrumentation. Certainly a composer to explore further. Olivier Schneebeli does the rhetorical side of the music full justice. Boy sopranos are used in the chorus - which makes for a beautiful ethereal and transparant choral sound - and they occasionally sing short solos. Nice! 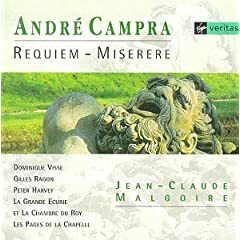 André Campra's Requiem (Disc 2) is a stunning (and very touching) piece. It has a very intimate, chamber music feel to it - beautiful use of woodwinds. Countertenor Dominique Visse has a very characteristical voice that is maybe not to each taste. Also here boy sopranos in the chorus, with some small solos. As I said in an earlier post: those who like Fauré's (and Duruflé's) Requiem and want to know where it came from, are kindly directed to the choral music of the French baroque. 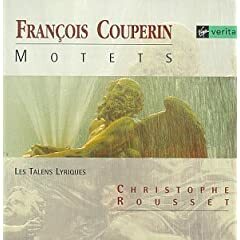 I was already familiar with François Couperin (Disc 3) and his detached, ethereal and intoxicating style. Those who are familiar with his Leçons de Ténèbres know what to expect! Smashing performance under conductor Rousset. 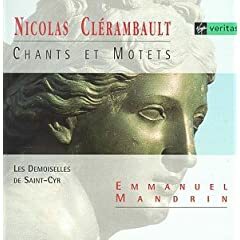 From Nicolas Clérambault (Dics 4) we get chants and motets in French baroque plainchant style (an adaptation of Gregorian chant). Beautifully done btw, but I'm not hot on plainchant! So this is up to personal tastes. 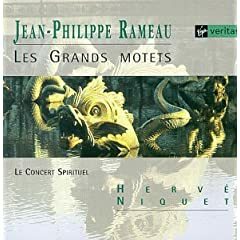 Impressive Grand Motets by Jean-Philippe Rameau (Disc 5). Interestingly these pieces are very much in the "galant" style of secular music written for the theatre! Very colourful instrumentation to boot. You've gathered by now: strongly recommended. Thanks for the posts and the links, Que! I have another Du Mont disc of Grands Motets. His music is indeed quite grand and complex. Oooh...mouth-watering program. Thanks for pointing this out! I have been meaning to get into this thread, but I have been exploring so much of the French Baroque that it is hard to know where to start. Heather, thanks for posting! The opera's of the French baroque are quite interesting and very distinctive, and judging from the reactions there is quite a lot of interest in them here. And indeed there is so much to discuss. But we have all the time in the world: this thread could be a 100 pages (or more) as far as I am concerned... Please don't feel restricted to what's currently discussed - if it's French baroque: just pitch in! I'll continue to post impressions on my new recordings. A new Charpentier, Naïve has "repackaged" (just a cardboard slipcase with a different cover) some earlier issues and is selling them at midprice. 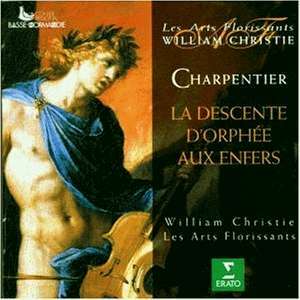 So I got this Charpentier issue, the actual CD cover is shown next to it. So, this is quite different from the Charpentier I've heard so far. 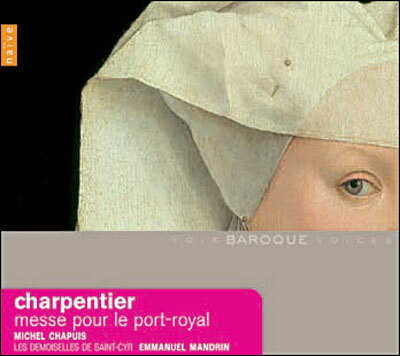 And this is confirmed in the booklet: this is Charpentier at his most austere. We have just an organ - a beautiful historical instrument from 1735 which is superbly played by Michel Chapuis - a continuo (basse de viole) and a female chorus conducted by Emanuel Mandrin. I think those of us who are familiar with "early music" and/or into choral singing, will maybe easier connect to this than others. So, soberness and restraint, but also some brilliant and very touching choral music. Like I said, Chapuis does a great job and the singing is very strong and full of character. Oh, this is no plainchant BTW. I'll happily return to it once in a while. Have most of the recordings you posted Que, and love to read about it. You have a way with words my friend, and your English is far better than mine, so I meander in your stream, without participating, if you don't mind. Keep this thing afloat, I learn and learn about your collection. time; it has been neglected far too long. And it is nice to have such expert interpreters as William Christie and Marc Minkowski; so far I have not found a single dud in all of their output. Ditto as to Christie. Haven't heard much Minkowski. Hopefully Drasko doesn't mind if I repost on this thread the interesting recommendation he made earlier. Excellent! 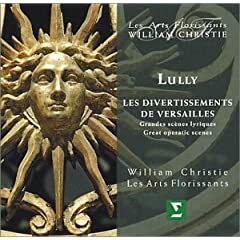 Definitely recommended as introduction to Lully as the selection of scenes and airs spans his entire career, from early collaborations with Moliere (plays with music) to his operas (tragedies liriques) of later period (Isis, Roland, Armide) and nicely presents his development (and that of French music of late 17th century at the same time). Performances are uniformly brilliant and so is the recording. 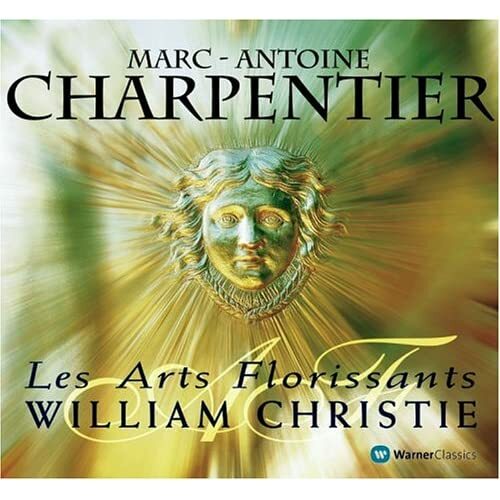 Erato has repackaged 4 issues with music of Marc-Antoine Charpentier with William Christie in a cardboard slipcase (1st picture) at less than half of the original price! - and even less from Amazon Market sellers ... (only available at the European Amazons). You get the original issues - so they have full texts. And that is important because three of them are with theatre music, and it is essential for their enjoyment to be able to follow the text. One disc does not contain theatre music but the "In Nativitatem Domini Canticum", a small and beautiful Christmas oratorio, and the "Messe de Minuit pour Noël". The Christmas oratorio begins with a solemn tenor recitative and chorus, and a quiet, introvert interlude for strings which mysteriously forbodes the birth of Christ (complete with soft sound of a bell at the conclusion), followed with elegant and more joyous recitatives and choruses. The approach by Christie in the "Messe de Minuit" is more expansive - especially in the instrumental interludes - and less urgently than by Minkowski. I prefer the latter. Divertissements, Airs et Concerts is absolutely packed with small but delightfull goodies. It starts with a short (8 minutes) "musique en scène" (two choirs, two arias, a duet and and instrumental interlude) for the comedy "La Pierre Philosophale" (The Philosopher's Stone) by Pierre Corneille. Then are several airs sérieux - accompanied dramatic songs ("arias"), followed by a few lively chansonettes and airs à boire with dance rhythms. The disc concludes with a pastoral chamber opera "Il Faut Rire et Chanter: Dispute de Bergers" (Quarrel of the shepherds). What strikes me is the consistent high quality of the music: never a dull moment, always very entertaining or touching. Imaginative and varied instrumentations - organ or harpsichord as continuo, theorbo's, a guitar, recorders (! ), oboe and bassoon - yummy yummy... 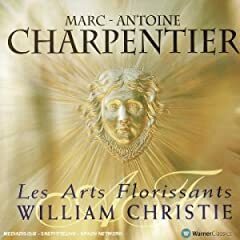 I think the connection with the text is important, because Charpentier attunes the music perfectly to the words. The comical elements are very real and convincing IMO! Superb musical execution by Christie and party - excellent singers like Patricia Petitbon, Sophie Daneman, Paul Agnew, etc. "Les Plaisirs de Versailles" is an allegorical chamber "opera" or "operatic divertissement". Possibly written to be performed for Louis XIV, who is directly addressed in the piece. The story is the classic theme of the competition between music ("La Musique") and words ("La Conversation"). Comus, patron of feasts, and "Le Jeu", patron of gaming, join in. Terribly witty stuff - convincingly projected by the excellent singers (Sophie Daneman, Patricia Petitbon, Katalin Károlyi, et al.) who very much have to act at the same time. Gorgeous instrumentation with flutes. What follows are three airs sérieux composed for Pierre Corneille's play "Le Cid" - plangent and dramatic. The disc concludes with a "pastoraletta" - a pastoral cantata - called "Amor vince ogni Cosa" (Love conquers all.. ). Of course the plot includes shepherds and shepherdesses, their patron the god Pan, a wolf and a lamb, and lots of love! A very cute piece with some exquisite arias. Finally the pièce de résistance: "La Descente d'Orphée aux Enfers" - a real chamber opera. A very dramatic and eloquent piece with ample musical and emotional depth. Save it for last - all the qualities mentioned in the two other discs with theatre music, culminate here. 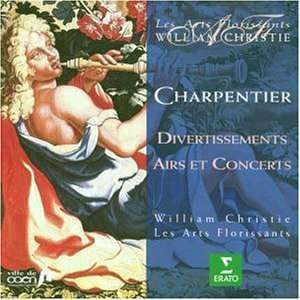 All in all this is an exciting set, hearing this music settled with me Charpentier's status as a major (French) baroque composer. 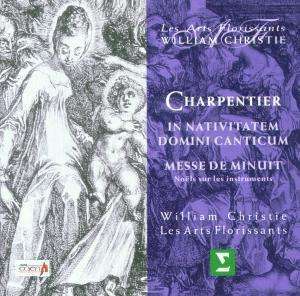 The disc with the Christmas music is very enjoyable, though the "Messe de Minuit" is not my preferred recording. The three discs with theatre music are all superb, must-haves for those who are into the genre. Clearly this amounts to a strong recommendation! That is why I bought it the moment it was on the market my friend, and I posted that to, to alert all on the board, but you are the only one that has reacted, if not to my call, than by own accord. Anyway its the deal of the month. I will start listening to it soon. I have now gone through a substantial part of this set, and my impressions of it have settled. This is my second complete Couperin harpsichord music set, the other being by Christophe Rousset (HM). The newly set with Noëlle Spieth on the small French label Solstice, quite different from the Rousset. In harpsichord music, the recording and the instrument play an important role. The recording was at first a big change to get used to: not the bright, crystal clear and in-your-face sound of the Rousset, but more mellow and sonorous - more "woolly" so to speak. Spieth uses different five French harpsichords. The interpretation. Noëlle Spieth approaches these works from a modest point of view as a performer. Whilst Rousset is the genius on the harpsichord and showcases his brilliant technique and imposes his highly individual and slightly idiosyncratic interpretation on the music, Spieth IMO lets the music more "speak for itself" - maybe a platitude but true. Rousset indulges in the exotic qualities of the music and focuses on very twist and turn, which leads to intriguing brilliancy but also emotional detachment. The image of the music can appear rather static at times. Spieth is much more flowing and sober, she draws longer lines and this gives more focus on the proportions of the individual movements and puts them better in perspective in relation to each other. 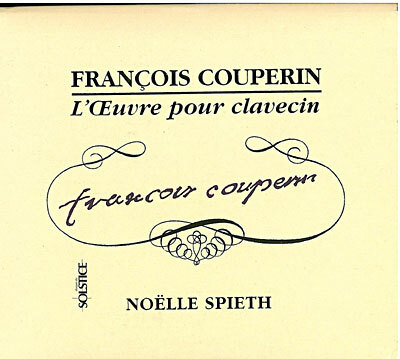 Spieth's Couperin's is more human in scale and touching. PS A comparative review of available Couperin sets to be found HERE (in French). Que, thanks for this interesting comparation. I wonder, if the music gets "better" with Spieths reflective approach, or if Rousset´s brilliance is necessary for the music to shine. My considerations reflect of course the fact, that I never felt much attraction to the music, even if I have made quite an effort to get to know it better. If Leonhardt had recorded an integral set I would get it in a heartbeat but alas that is unlikely. In my opinion Couperin's clavecin music becomes shallow if overwrought, and that is something Leonhardt never does in the several recital discs I have heard. To me Couperin's music is just about human as Debussy's, both requiring that one "feels" rather than "be impressed by" it. Indeed, for now I feel that both approaches have their attractive sides. I read this as 1 - 0 in Spieth´s favour.